SKU: ZRFxxx-4. Categories: Novelty Signs, Zombie Hunting Accessories, Zombie Stickers. Tags: response team, response vehicle, Zombie, zombie apocalypse, zombie outbreak, zombie research, zombie research foundation, zombie response, zombology. In the case of a Zombie Outbreak, it is imperative to let the populace know who is trained and able to respond to Zombie Outbreaks. Other Safety Agencies know to give priority to trained Zombie Response Teams during an Outbreak. Use these stickers to clearly indicate that you or your vehicle has authority to enter Outbreak Areas. 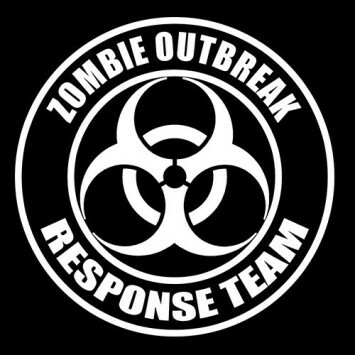 These Indicitive Zombie Outbreak Response Decals have been designed and approved by the Zombie Research Foundation and we have been authorized to bring them to you at a low cost! If you are in need of a large number of these Die-Cut Zombie Outbreak Response Team Designation Decals for your entire Zombie Response Team, please contact us for a bulk-rate discount.